Erin Dilly is the hardest working mom on Broadway. The real-life mother of two is playing Mother in A Christmas Story, breaking hearts every night with her portrayal of a mom trying to cling on to every moment with her children. The veteran actress is well-versed in playing lovable leads, having brought to life Truly Scrumptious in Chitty Chitty Bang Bang (a Tony-nominated performance) and subbed for Kelli O'Hara as Billie Bendix in Nice Work If You Can Get It. Broadway.com chatted with Dilly and got the lowdown on what it's like to be a mom on Broadway, how she's prepping for the holidays and why you'll never see her play a doctor or lawyer. I'm sure you're especially close with your onstage sons, Johnny Rabe (Ralphie) and Zac Ballard (Randy). Is there a club of Broadway moms? God bless the Broadway moms club. My personal Broadway mom club is comprised of Kelli O’Hara and Jennifer Laura Thompson, who are down the street in Nice Work. Then I have my pal Andrea Chamberlain, who is in Elf, and my friend Catherine. There’s just such a mutual support of what we’re trying to do, which is to support our family but also go home and continue our life’s work with our beautiful little people. A funny thing happens when you have babies: You don’t go away, but what you have to do in the world—just the reason that you do it—changes. 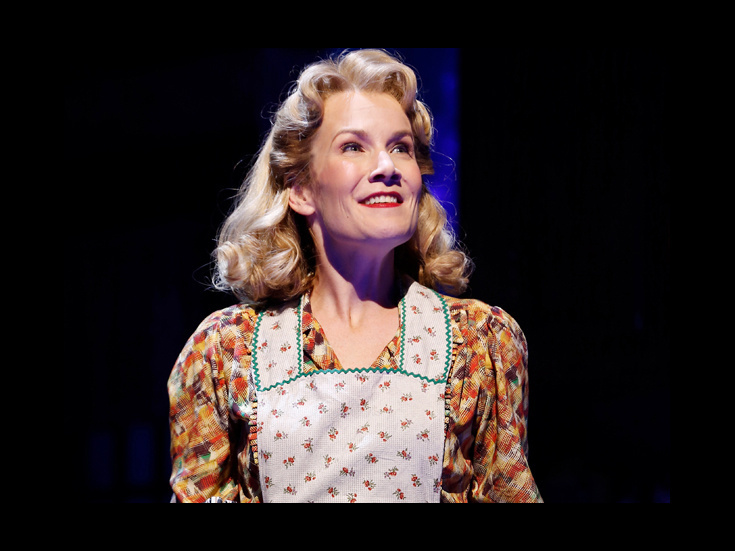 What was it like to sub for Kelli O'Hara in Nice Work If You Can Get It? It was fantastic in that I got to work episodically on Broadway, which is exactly what you want to do when you’re a mom. It was also such an easy passing of the torch. Kelli is one of my best friends, and Jenny Thompson and I went to high school together, and Michael McGrath is one of my husband’s best friends, so the homecoming of the cast was lovely. I had done developmental work on the piece, so the material itself was familiar to me. Matthew [Broderick] was delightful, so warm and so welcoming and such a pleasure to be with on stage. And off stage, he's just one of the funniest, smartest people I’ve ever known. What’s up for you after A Christmas Story? I’m starring in Fiorello! in the Encores! series, but luckily I have a fat two weeks to just chill out with the girls. I would be in some serious trouble with them if I didn’t have a little time off. I also do some teaching, so I’m going to start a five-week master class in February. See Erin Dilly in A Christmas Story at the Lunt-Fontanne Theatre, through December 30.